This LaunchBar action is my preferred way to get said job done. I trigger it all the time for everything that is more of a short-lived nature, whether it’s setting a tea timer or to remind me checking some website in 20 minutes after I’ve dealed with the task at hand. 90% of my other reminders go in Due. Yes, Alfred is also nice and super cool. Still, LaunchBar is my go to launcher since I prefer the way it handles file navigation/opening/everything. I use Alfred, too. Mostly for some clever workflows which I don’t plan to port to LaunchBar or Keyboard Maestro. All in all, I find them to be very close. If you are willing to recreate some workflows/actions you don’t have to be as nuts as me running both. I imagine I’d kick one of them if I had a portable Mac just to save some resources. This is a meta post. I felt it was about time to talk to you again and tell you what (not) happened to this blog. I try to keep it brief. Promised. In fall last year I told my parents that I have problems regarding that thing I vaguely mentioned from time to time in this blog: depression. In the last decade I have isolated myself a good deal – I’m a hermit – and only my girlfriend knew about my condition. In November 2014 I had some financial problems. I knew that by February 2015 I would have no money left. This caused my depression to reach new heights – at least that is what I think is my happening in my brain, I don’t know for sure. I spend a week sitting on my sofa just starring blankly into the abyss, so I’m fairly sure it is depression. In January 2015 the financial problem was solved – a lucky coincidence. I now have a steady income. I haven’t had one for 10 years. At least in that regard I have more peace of mind now (although I do not know for how long I will get my paycheck… but this doesn’t matter right now). A month ago I build up the courage to finally see a doctor and currently I’m on the waiting list for a free spot. I started to meditate (and not only do the guided relaxation tapes) and talked with more people who had similar problems. Putting it all together, I’m in a much better place than when this year started. My thanks to every one of you who checked in on me during my hiatus. Writing RocketINK was always some kind of antidepressant for me and I will continue writing here. It is a bit hard to get into writing again. I want to, but there’s a barrier at the moment. This is why I’m activating security protocol B2. As you can see there is no “teaser image” at the top. I’m trying to streamline my writing process. As little work as this picture is/was, from now on I won’t put it on every post – it always kept me from doing short link posts and sometimes from writing larger articles, too. I have a few other ideas in my head and will go back to the drawing board for RocketINK V2. WLPPR is a great resource for everyone who wishes to see our little planet from out of space. They got beautiful wallpapers and even have a couple of shots from Mars. Quick question: What is the best way to get back to posting on one’s blog after a long dry period? The answer is easy. Write a short post about an awesome piece of design, preferably a Mac app. Now witness doing exactly that. 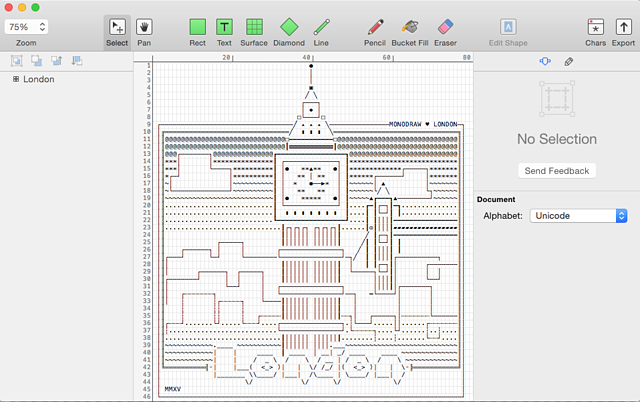 The subject of todays post is not just any Mac app… it’s an ASCII art editor. 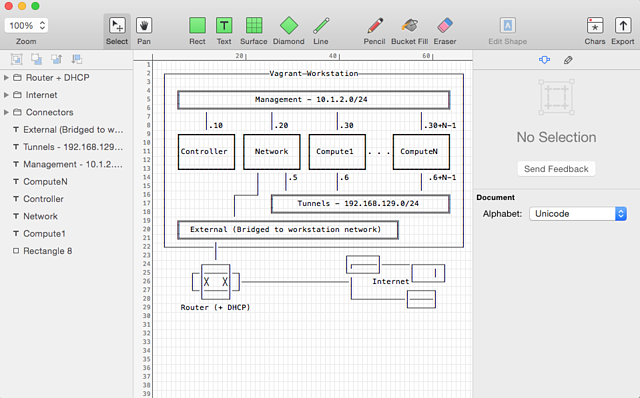 And what an editor it is: Monodraw by Helftone is a nerd manifest – think Photoshop for ASCII art. Plain text has been around for decades and it’s here to stay. 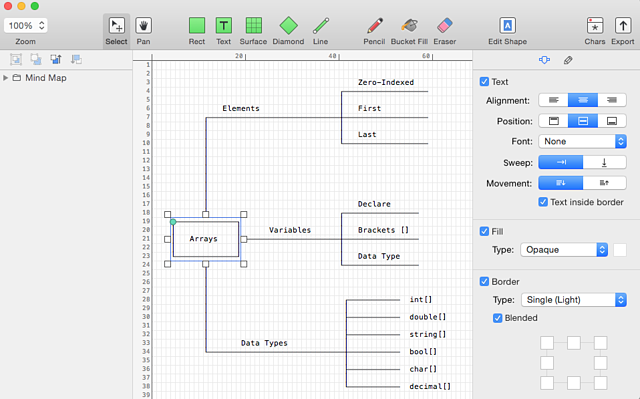 Monodraw allows you to easily create text-based art (like diagrams, layouts, flow charts) and visually represent algorithms, data structures, binary formats and more. Because it’s all just text, it can be easily embedded almost anywhere. 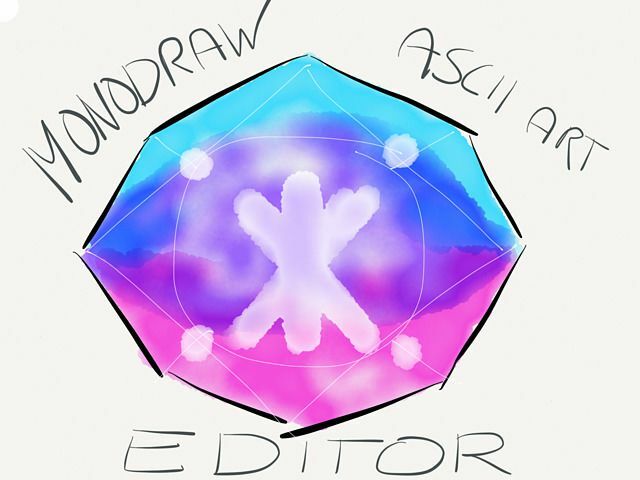 The Monodraw beta is now publicly available. Go ahead download the trial and decide for yourself if it’s something for you. If your answer is “Yup. An ASCII art editor is most definitely what I dreamed of in those cold lonesome nights” then you can put your order in and get the early adopter price (which is 40% off aka $29.99). 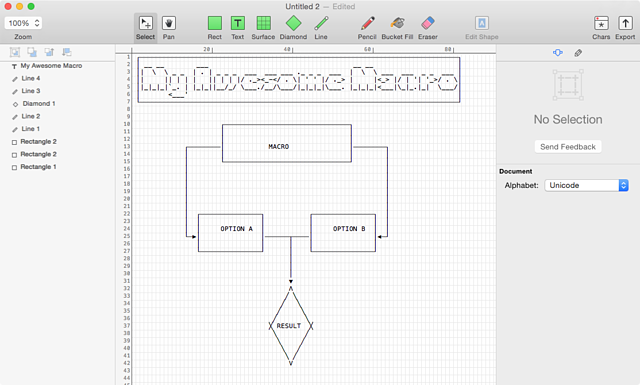 As you can tell by now, I find the idea of a pro level ASCII art editor utterly cool. Since I first read about Milen Dzhumerov’s (@milend) and Atanas Mahony’s (@amahony) idea to build such an app, I couldn’t wait what these two guys bring to the table. The wait was worth it. 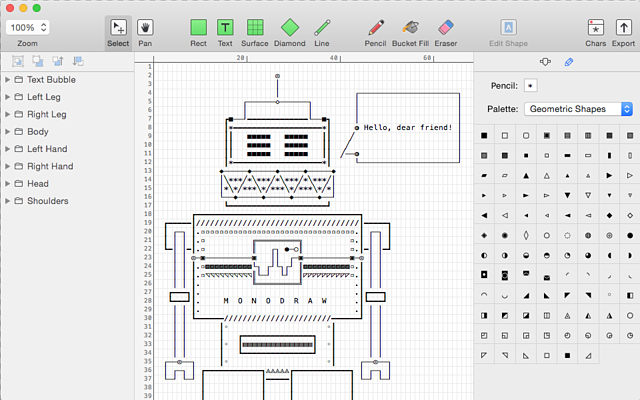 Some of you might argue that $50 for this app is a steep price, but keep in mind: the market for an ASCII art editor is assumably smaller than for a Photoshop or Illustrator alternative. Feature-wise the price is also justified. In short: I hope $50 from enough people will support the development up to a version 2.0 someday. Some of the use cases for the nerdy folks out there are outlined on the website. If you want to create a unique mind map or flow diagram, this is a strong contender. If you want to beef up the documentation for your latest command-line utility, go Monodraw and make them shine. Enough talk, more pics. PS: Good to be back.